With the support of the Ronald Coase Institute, Ning Wang is managing a team that is sorting though 60 boxes of Ronald Coase's manuscripts, writings, and related materials stored at the University of Chicago Law School. Eventually, Ning Wang will produce two sets of books drawing on these materials: The Collected Works of Ronald Coase and Ronald Coase on Law and Economics. He is also working on an intellectual biography of Ronald Coase and has been interviewing Coase's colleagues and students. 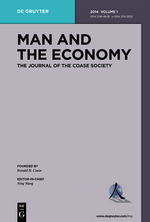 Continuing Ronald Coase's plans to start a new journal, Man and the Economy, Ning Wang is the editor in chief. The journal welcomes empirical investigations - historical, qualitative, statistical, experimental - and theoretical explorations that deepen our understanding of how the economy works and how it changes over time. The inaugural issue was published in July 2014. The book How China Became Capitalist, written jointly by Ronald Coase and Ning Wang, has won many prizes around the world, including the 2013 Sir Antony Fisher International Memorial Award for the book contributing most to the public understanding of a free society. In Chinese translation, it won the 2013 Beijing News Award for the Best Book in Economics in 2013 and sold over 100,000 copies in China in its first year in print. At the 2014 meetings of the International Society for New Institutional Economics, Ning Wang was a keynote speaker at the plenary session honoring Ronald Coase.